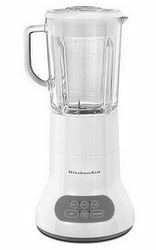 3 Speed Classic Series Blender - White. Three speeds provide consistent blending and versatility for all of your tasks. Smooth touchpad control panel includes chopped ice and smoothie buttons. All-metal base; cord storage; owner's manual and recipe guide included. Price $100 Based on the manufacturer's suggested retail price (MSRP), this blender is PRICED ABOUT AVERAGE when compared to all other blenders. Stars Based on actual user experience and reviews, this blender is RATED HIGHER THAN AVERAGE by 5 USERS and ranks in the TOP 7% of all blenders. 100% of users rate this blender favorably. Overall, it's stylish, takes up very little space on my counter and works like a dream. It's super easy to clean as well. I'm very pleased with the blender: As long as there's enough liquid involved, has not been fazed thus far by frozen items. It does what it's supposed to do very well. This blender is the best blender I have ever had. I use it every day to make smoothies and it is perfect. I love the design - it looks great on my counter.